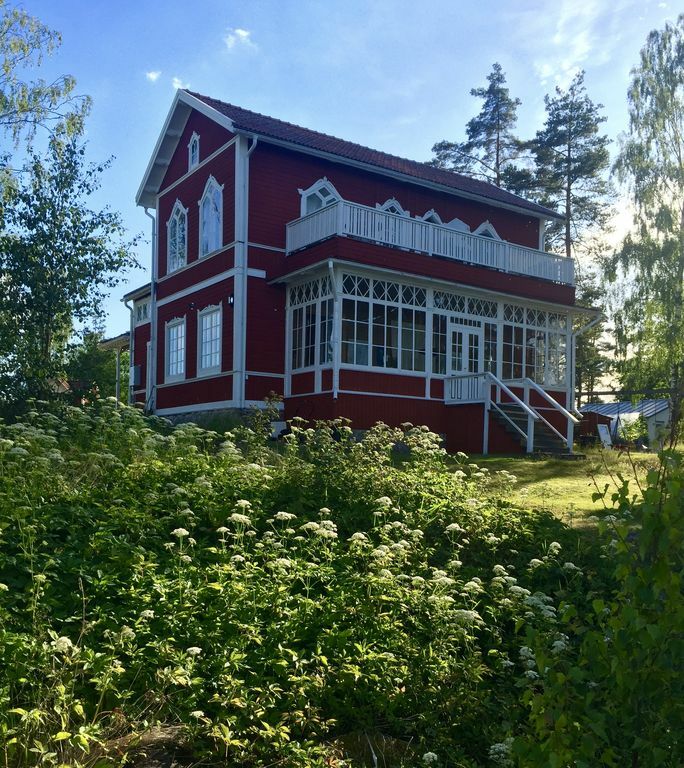 Here you have the opportunity to experience a real archipelago summer in a fantastic villa from the end of the 19th century, located on Resarö in the Stockholm archipelago. You are on a headland with the sea in all directions. To Resarö you take a car. You have Vaxholm within 10 minutes and Stockholm within 35 min drive. The house is one of Resarö's oldest, newly renovated but maintained contemporary charm. Open fireplaces in three of the rooms including the kitchen. The villa is situated on a large lake with its own jetty, rowing boat and sauna, In the garden there are tree house, swings and trampoline for the children. Here you can enjoy breakfast on the balcony or the pier while watching the sun rise or dinner on the large glass veranda. Sauna with room for many and a relaxation room is located next to the bridge. Large jetty with sailboat depth, sun loungers, bathing ladder, and views of the sea lakes. A rowing boat is also available to borrow. In the house there usually lives a cat, so it is not suitable for allergy sufferers. Bicycles can be arranged as needed. Close to wooded areas and public baths. Supermarket and restaurant and tennis court are within biking / walking distance. Close to Vaxholm where you will find both shops and restaurants in the picturesque skärgårsmiljö and archipelago boats can take you to Stockholm or further out in the archipelago. We stayed at Lisa's house for a couple of days over New Year. We couldn't have asked for more: Lisa was a very kind and generous host and the house had everything we could have wished for. A Sauna next to the sea, beautifully designed rooms, comfortable beds and a fireplace we could enjoy. It was one of the most relaxing holidays I've experienced. We travelled with a baby and Lisa even thoughtfully prepared a baby bed. Thumbs up for a conveniently located dream house (just 30 minutes from Stockholm and 40 minutes from the airport) with very kind owners. Das Haus ist ein Traum. Man hat einen unglaublichen Panoramablick auf die Ostsee in 3 Richtungen. Da das Haus sonst von Lisa und ihrer Familie bewohnt ist, hat man nicht das Gefühl in einem Ferienhaus zu sein, sondern einfach als Gast in einem urgemütlichen Zuhause. Wir haben bei gutem Wetter auf dem Steg gegessen, aber die Alternative in der Veranda war ebenso schön. Im Garten durften wir uns am Hochbeet mit Pflücksalat und Kräutern bedienen, ebenso standen uns alle Gewürze zum Kochen zur Verfügung. Die Sauna lädt mit Blick auf die Ostsee und der Möglichkeit, anschließend direkt ins Wasser zu springen, ein. Alle Nachbarn sind unglaublich nett, insgesamt haben wir auf ganz Resarö nur nette Menschen getroffen. Unser Sohn ist täglich mit dem Ruderboot zum Angeln (leider erfolglos)rausgefahren. Wir können das Haus und die Gastgeber wärmstens weiterempfehlen und kommen selbst sicher wieder! We had a perfect stay in this beautiful and historical house and enjoyed midsommar with the folks around. The villa was big enough for 2 young families (4 adults + 3 kids) and our host Lisa organized everything which might be missing (such as an additional baby bed) upfront, just to be on the safe side. Located in a very quite area on the island Resarö within the woods, you will reach it very quickly from the airport Stockholm Arlanda though. But this villa was more than just our home base for exploring Sweden. The patio was great for having dinner, we used the boat for a midnight trip (it is not getting dark in the swedish June) and we enjoyed the Sauna directly at the beach. We had one of our best holidays ever in Lisa's house. Everything one could ask for is available. The house itself is beautiful and carefully, tastefully decorated. The area is quiet, but Stockholm is easy to reach. We did not have a car, that might be a problem on rainy days (cycling to the shop is nice and not far away, but with bad weather I would not like to). Our children loved the jetty and beach in front of the house. Be sure: everything you see on Lisa's pictures is (in real) as beautiful as it seems. We hope to come back! Thank you so much, it was just a pleasure to have you as guests. 35 min drive to the city of Stockholm. 10 min drive to Vaxholm. Vaxholm - capital of the archipelago - and the gateway to Roslagen from Stockholm. Vaxholm is the junction for boat traffic between the archipelago and the northern archipelago. In Vaxholm are charming little shops with personal service, several restaurants and cafes as well as small quaint galleries. In the middle of town is the Town Hall and the Vaxholm Tourist Office.